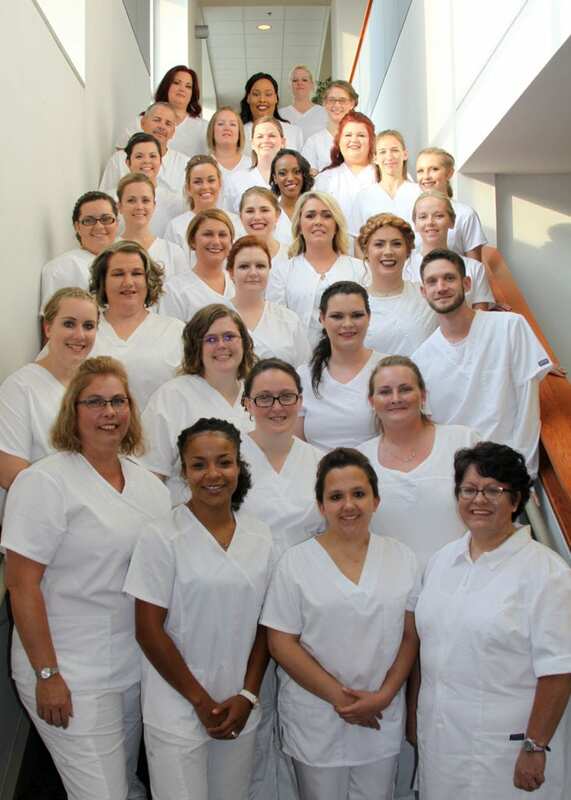 The fifth annual pinning and graduation ceremony honoring the students of the Hannibal-Lagrange University Practical Nursing Program was held on August 10, 2017. A class of 32 students received their pins after a 52-week course of study in the practical nursing program. The HLGU PN Program was established in 1961 and was sponsored by the Hannibal Public School System until its relocation and change of sponsorship to HLGU in August 2012. This graduating class represents the fifty-fourth for this program. Those honored were: Stephanie Barnett, Kayla Crew, Tiffany Hudelson, Hope Jones, Breanne McBride, Ashton Reynolds, Heather Smith, and Tiffany Yakes of Hannibal, MO; Melissa Boernson, Derek Eger, Alishia Harscher, Zakia Lewis, Scott McEntee, Courtney McGlaughlin, Haley Mester, and Lorelei Schlueter of Quincy, IL; Rebekah Calnan, Dannica Damron, and Rhylee Helms of Palmyra, MO; Melissa Corbin of Louisiana, MO; Brittany Dodds and Karissa Williams of Ewing, MO; Jessica Grummel and Destiny LeGrand of Bowling Green, MO; Taylor Jordan and Taylor Neely of Shelbina, MO; Alexis Kendrick, Brittany Barbee, and Michelle Talton of Monroe City, MO; Lacey Kistner of Payson, IL; Angel Morrison of Pittsfield, IL; and Alyssa Starr of LaBelle, MO. Recipients of special awards were Heather Smith, General Nursing Proficiency Award; Taylor Neely, Clinical Nursing Award; Angel Morrison, Brandie Kearns Memorial Nursing Personality Award; Stephanie Barnett, Rhylee Helms, and Tiffany Hudelson, Beth Haven Community LPN Scholarship; and Kayla Crew, Dannica Damron, and Jessica Grummel, Hannibal Clinic Award. Scholastic achievement awards were presented to the top 20% of the class and were received by Heather Smith, valedictorian; Rebekah Calnan, salutatorian; Angel Morrison, third ranking student; Tiffany Hudelson, fourth ranking student; Stephanie Barnett, fifth ranking student; Kayla Crew, sixth ranking student; and Rhylee Helms, seventh ranking student. Zakia Lewis was recognized with the best attendance award. Awards were made possible by the Northeast Missouri Medical Society, Hannibal Regional Hospital, the family and friends of Brandie Kearns, Mennonite Home Association, Hannibal Clinic, Maple Lawn Nursing Home, and the HLGU PN Class of 2016. The guest speaker for the evening was Trista Long, DNP, RN, MBA/HCM, ON-C, director of the medical/surgical/orthopedic unit, Hannibal Regional Healthcare System. Special music for the ceremony was presented by the Hannibal Regional Heartbeats. Class pictures were done by Angela’s Photography. HLGU PN faculty includes Anne Riggs, DNP, RN, director of the Craigmiles School of Nursing; Gwenda Pollard, MSN-Ed, RN-BC, coordinator/instructor; instructors Karry Weston, MSN-Ed, RN and Lynn Ogle, BSN, RN; and adjunct instructors Anne Wilson, BSN, RN; Laura Davis-Maas, MSN, RN; Amanda St. Juliana MSN-Ed, RN; Amelia Seiler, MSN, RN; Janet Stuckman, MSN, RN; Michelle Wallace MSN, RN; and Kimi Yuchs MA(N), RN, NE-BC. The Hannibal-LaGrange University Practical Nursing Program is a 52-week certificate program located on the university campus. Classes start each year in late August. The program is affiliated with Beth Haven Nursing Home, Hannibal Clinic, Hannibal Regional Hospital, James E. Cary Cancer Center, Maple Lawn Nursing Home, Marion County Health Department, Mark Twain Behavioral Health, Turning Point Recovery Centers, NECAC Family Planning and Ralls County Health Department. For program information or application, please contact Kathryn Martin, nursing admissions coordinator, at 573-629-3141, or Kathryn.Martin@hlg.edu.